Let’s explore the famous German Christmas markets! During the winter months, the streets of Germany come alive with bustling Christmas markets. The outdoor festivals commence the Friday before Advent and showcase everything from German delicacies to local goods and gifts. Zip up your parka, tie your wool scarf, and shine your finest Glühwein mug. Let’s explore the famous German Christmas markets! Each year, The Stuttgart Christmas Market attracts 4 million visitors from all over the world. The market is so large it’s spread across several squares including Schlossplatz, Schillerplatz, Marktplatz, and Karlsplatz. With over 280 stalls tucked between Stuttgart’s palaces and castles, the market is a must-see for first-time travelers. The Frankfurt market dates back to 1393, and it’s traditionally the most medieval of the German markets. Stroll through the German city, listen to live music, drink hot mulled cider, and bite into a local marzipan cookie. The market is located at The Römerberg, in the center of Frankfurt’s Altstadt. Several markets appear in Berlin during the winter months, but the most popular takes place in central Potsdamer Platz. Visitors can participate in the Winterwelt, an outdoor center that features ice skating, a toboggan run, and Bavarian curling. The Potsdamer Platz attracts more than 3 million visitors each year! AESU offers several trips to Germany, including Cosmopolitan, Euro Spree, Explorer, Euro Focus, and our most popular tour, Great Escape. 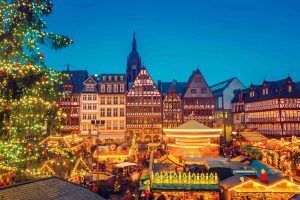 Explore Germany, and celebrate Christmas with the locals! This entry was posted on Wednesday, November 29th, 2017	at 10:11 am	. You can follow any responses to this entry through the RSS 2.0	feed. Both comments and pings are currently closed.